A top WalkUP Roslindale initiative is a new multi-modal “gateway path” into the Arnold Arboretum directly from Roslindale Square. An introduction to our vision is below; you can also print this PDF flyer as a quick introduction to the project. Update 2/18/19 – Bussey Brook Meadow Path Gets Recommendation for CPA funding! Update 8/17/17 – Roslindale Gateway Path & Blackwell Path Extension – Now combined and on the move! Update 5/9/17 – Roslindale Gateway Path 10% Conceptual Plan, and onward! Update 11/6/15 – Updated/Improved Version of Flyer With Modified Proposed Route. Update 3/7/16 – Arboretum Gateway Path Visioning Session March 30, 2016 at 6:30pm. The Arnold Arboretum is not only Roslindale’s greatest park, but among the most beautiful urban open spaces anywhere. In 1880 Frederick Law Olmsted wrote: “On (these) acres much the best arboretum in the world can be formed.” Today, some of Olmsted’s “emerald necklace” plan has been realized, but much remains to be done. We envision a new entrance to the Arboretum close to Roslindale Square, to make the park more visible and accessible to residents and visitors. 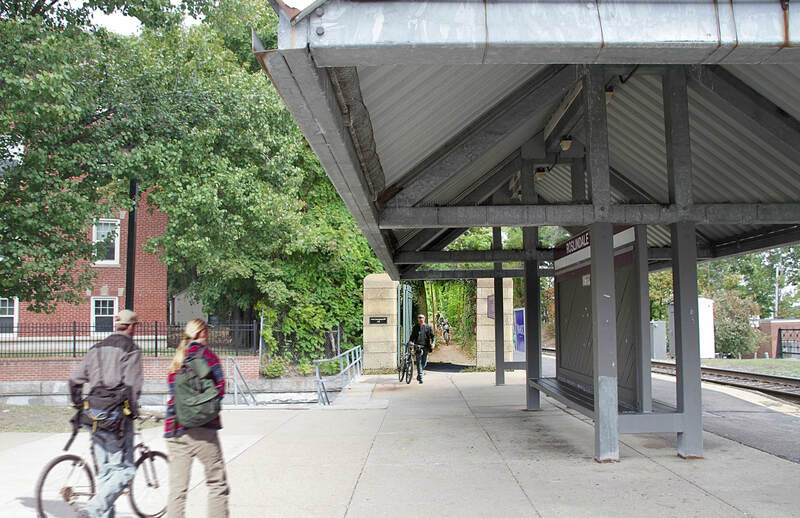 The Rozzie Gateway Path would start adjacent to the commuter rail platform, and continue at grade into the park, allowing access to the open space without the need to surmount the large hill that lead to the Mendum Street gate. The Path will continue straight parallel to the commuter rail tracks toward Bussey Street, and then connect up with the Bussey Brook Meadow path and on to Forest Hills. Washington Street lacks pedestrians amenities  and is unsafe for bicyclists; the Gateway Path will provide a better alternative to reach Forest Hills, where walkers and cyclists can avail themselves to the many amenities around Forest Hills; continue on to the Southwest Corridor Park; or board the Orange Line. And of course vice-versa — folks coming down the Orange Line or the Southwest Corridor will have a superior route to visit Roslindale Village. We have made significant progress in moving from idea to reality; if you’d like to learn more, please join our email list or contact us directly. We’d love to hear your suggestions or other feedback! This is a fantastic idea which aligns nicely with some of the goals laid out in the Roslindale Neighborhood Strategic Plan created back in 2007.
neighborhood” and “provide ‘wayfinding’ signage for pedestrians and drivers that show important links, such as from the Arboretum to Roslindale Square.” This proposal should do both, particularly if this path was well marked along its length. South Street provides an important connection to the Arnold Arboretum from the upper Washington Street area via Archdale Road. Although there is a sidewalk along Archdale Road, it ends where Archdale Road crosses under the MBTA railroad bridge and merges with South Street. There is a small, steep entry to the Arboretum at that point, but the more formal and accessible entry (Poplar Gate) is further along South Street at the intersection with Bussey Street. Sidewalk improvements along this section of South Street would provide a greatly improved community connection to the Arboretum. If the city is serious about the improvements it spells out in that document, this gateway path should receive serious attention. 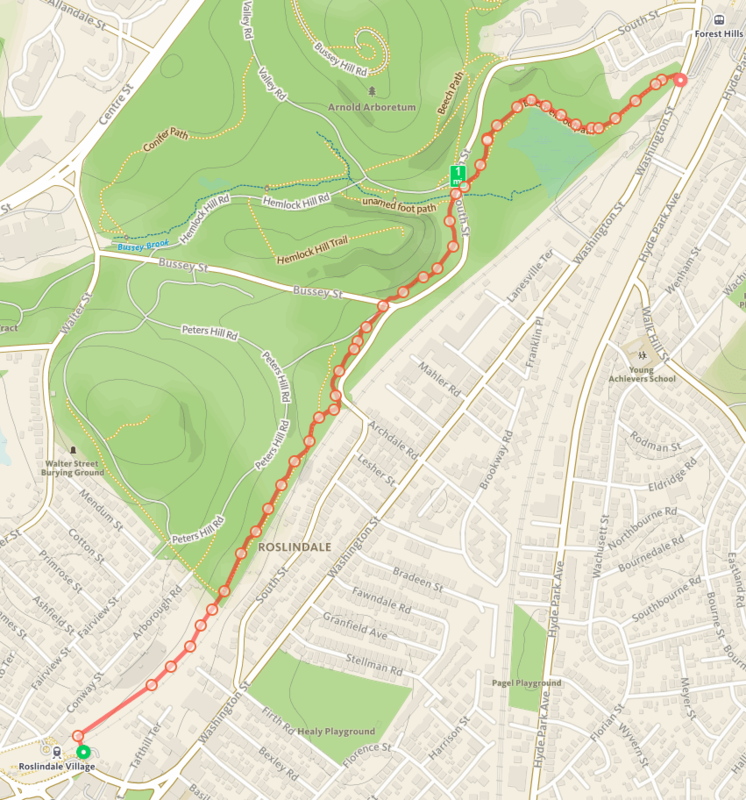 One question about the plan: Blackwell Footpath, which runs through the Bussey Brook Meadow, is currently unpaved, so biking is prohibited there. Would this proposal include opening that path to cyclists? We’ve actually heard from Arboreteum folks that biking is *not* prohibited on Blackwell, although they may not have been certain. But yes, absolutely, having Blackwell be bike-enabled (possibly with some widening and packing of the dirt) is at least part of the working plan. That’s interesting about Blackwell. I have always assumed that biking is prohibited there because of the “biking on paved paths only” signage throughout the arboretum. Most of the unpaved paths have additional signage indicating that bicycles are prohibited, but Blackwell does not have those signs – perhaps that’s intentional? It would be really valuable to cyclists if biking were allowed there, as there aren’t any other convenient routes to Forest Hills that feel safe. That stretch of South Street feels very dangerous to me, and going around Bussey Hill is a much longer ride. As far as I know, biking there is allowed, I have certainly done it often. But by far, the greatest obstacle for cyclists using the Blackwell path is poor access to the South St. entrance. This proposal would largely solve that problem, making a non-Washington St. route feasible for many more people to enjoy. I think the concept of a safe path from Roslindale Village to Forest hills is a great one. I see a couple challenges with the proposed alignment. The Arboretum is private property, controlled by Harvard. This really should be a public asset is possible. Also, the Arboretum is closed at night, limiting the benefit of the path. 1) Path along the commuter rail alignment, just outside the Arboretum. Jeff: all valid points. Technically, the Arboretum land is owned by the City of Boston; however, Harvard practically controls it so it is certainly not as “public” as a true public way. We should also mention that a fair amount of the land in question is actually owned by the MBTA. We have been meeting with both the MBTA real-estate people and the Arboretum to identify any issues (thus far no blockers have appeared). An alternate route that tracks more closely to the commuter rail track is absolutely worth considering as part of the feasibility analysis. Finally, dedicated infrastructure on Washington Street would be excellent, although it is almost certainly going to be a longer and more difficult effort to get it accomplished. In addition, the Gateway Path discussed here is not merely a link from Forest Hills to Rozzie Square, but also will provide better access to the Arboretum from various points in Roslindale, and for that reason has community benefits that are independent from improving the Washington Street corridor. Comments: 1) The Arboretum, owned by the City of Boston and leased in perpetuity by Harvard to be run as an Arboretum, falls under the city park rules. Biking is allowed on paved and carriage (or fire) roads (albeit at a pace of only 5 mph), but not off road. Biking is allowed on the Blackwell foot path. There are many bike commuters who use it. Hopefully it will never be paved but remain gravel. 2) The MBTA land from the southeastern end of the Arb to the Rosi commuter rail station extends 100 plus feet toward the parallel street – Arborough road. It is undevelopable in part to there being no possible road access into it and from being very steep for a most of the stretch. A pedestrian/bike path could easily be placed along the rail tracks. In the Arb at present there is a narrow foot path that runs parallel to the tracks on what once was railroad land, but was incorporated into the Arb when the rail line was rebuilt for the commuter rail. 3) Ideally a street crossing could be added across South near the Peters Hill Bussey street entrance and the path extended up the east side of South st to connect to the Blackwell path. 4) As for a segregated bike path on Wash st – I would love to see it but with the street parking it seems unlikely. I’d be happy if the city would just re-stripe the lanes. I like this concept but one observation is that I would hope that the path, to the extent it is cutting through the Arb., would be constructed in a way to create as little “impact” as possible on the feeling, and existing use, of the Arb. Although the land between the Roslindale commuter stop and the edge of the Arb. is currently un-used/forested, once inside of the Arb. there is currently a well used dirt foot-path. Hopefully the pathway being considered here could also be earth or gravel, rather than paved. Having a stretch of black pavement running through that part of the Arb. would really change its character and take away from the fact that it is an Arboretum and a park. Also, has consideration been given to a crossing at South Street that continues the new path to the Blackwell via the currently forested area between the commuter rail tracks and South Street? That area is utterly unused and could be turned into a path without impacting existing Arb. trails. There may be flooding and drainage issues that would make this difficult (I don’t know), but it is something to consider. Hopefully, this too could be made of gravel/earth so as to avoid another strip of black pavement. Overall, I think this is an excellent idea and would make a walk/run/bike connection to the SW corridor, and thus to downtown, a much more viable option. I love the walking path that parallels the train tracks. It would be great to see it preserved just for walking. There already is a large paved road right through the Peter’s Hill section of the Arboretum. I think it would be more valuable to preserve green space for walking than to have people cut through on their bikes on the existing footpath. Why can’t they use the existing road? Large hills are part of bike rides. I also would like to see the route be on the undeveloped section of the Arboretum that parallels the train tracks once you cross the intersection of South and Bussey Streets. The unused tunnel could be opened up and integrated into the plan. I certainly hope more pavement isn’t in store. Too much of the Arboretumi is already paved. As the planning goes forward for a bike path I’ve become aware that the path may impact coyotes and other wildlife that reside on the hillside which parallels the railroad tracks. Urban wilds are precious. Lets do our best to not disturb habitat while making some space for cyclists. I welcome hearing from others who feel as I do.